Cambodia’s garment factories appear to be ramping up their use of subcontractors, which tend to get the least attention from regulators and raise the most fears of abuse among labor rights groups, according to a report released on Monday. In its latest bulletin on the country’s all-important garment sector, the International Labor Organization (ILO) looks into why exports continued their strong growth last year, rising 7.2 percent to hit $7.3 billion, even as the number of workers and registered exporting factories fell. After years of consistent growth, the sector’s workforce fell nearly 3 percent last year to 605,000. The number of factories fell from 699 in 2015 to 626. The ILO says faulty—but improving—Commerce Ministry statistics and rising productivity likely explain some of the trend. But it warns that exporting factories may also be relying increasingly on subcontractors, with worrying consequences. “A rise in employment and production in subcontracting factories could be a concerning development if subcontracting is being used as a way to undercut regulations, including labour law and the minimum wage,” Maurizio Bussi, ILO’s country director, said in a statement. 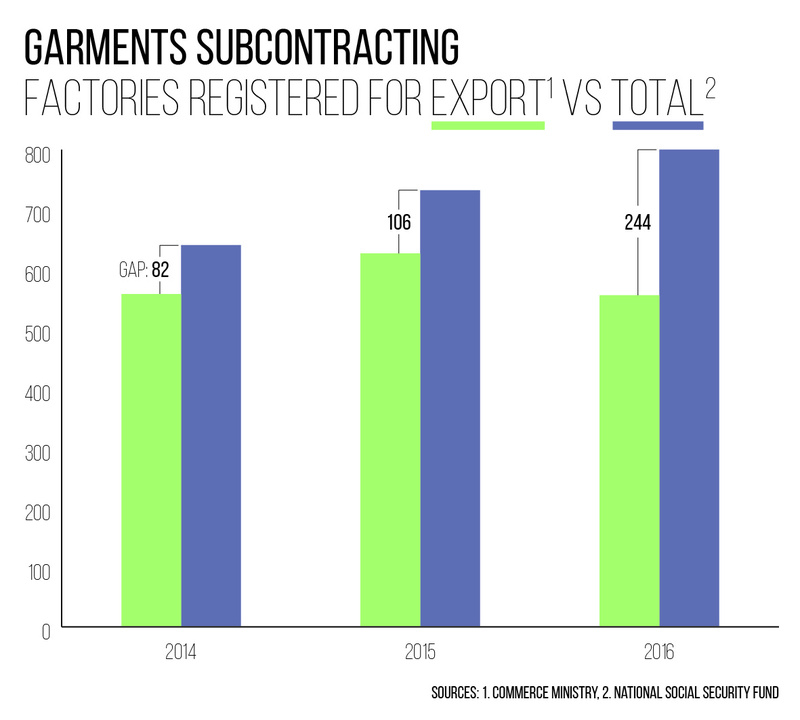 To get an estimate of the number of subcontractors, the ILO, a U.N. agency, compared the Commerce Ministry’s list of registered exporting factories with separate figures kept by the National Social Security fund that capture all garment factories with at least eight employees, whether they export or not. The ILO notes that some of the factories counted by the fund may be producing for the local market only, but adds that they’re believed to be a “very minor” part of the whole. Comparing the separate sets of figures reveals that the fund counted 82 more factories than the Commerce Ministry did in 2014, 106 more in 2015, and 244 more last year. The ILO says the subcontractors may be operating above board, but could also be used to evade the law as they may get less attention from government regulators. The ILO’s own Better Factories Cambodia program skips them entirely, one of the main criticisms of their inclusion. A spokesman for the Labor Ministry, which monitors garment factories, could not be reached for comment. But Ken Loo, secretary-general of the Garment Manufacturers Association in Cambodia, was highly skeptical of the ILO’s interpretation of the numbers. Though the report implies that the fund’s numbers apply strictly to garment factories, Mr. Loo said he believed they may include other enterprises as well. He was also doubtful that the year-on-year increase in factories captured by the fund actually represented new facilities, given the introduction of medical insurance to its list of services last year. “This forces them to go down to all the factories, and this helps them, obviously, in capturing more factories,” he said. Mr. Loo said he would take a closer look at the fund’s number’s before drawing any further conclusions.